Awards and accolades are important pit stops on a meaningful journey towards success. However, the award is all the more valuable when it comes from being a preferred strategic partner of a world-renowned brand like SAP. 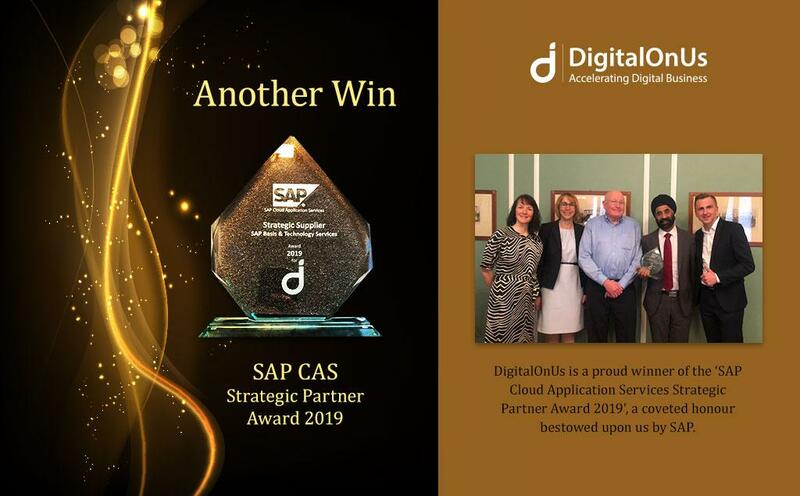 DigitalOnUs is a proud recipient of a ‘SAP Cloud Application Services Strategic Partner Award 2019’, a coveted honor bestowed upon us by SAP for Basis and Technology Services. We are one of the very few Global Strategic Partners for SAP Cloud Application Services (CAS), supporting over 650+ customers on behalf of SAP Cloud Application Services across North America, South America, Europe and APJ from our delivery centers in Mexico and India. SAP has recognized us for our exceptional performance in Services Delivery to the SAP Customers. Back in 2015, S Srinivasan, Chief of Agile Operations at DigitalOnUs started the SAP business. Within a span of just 3 years, the team has grown to 65+ members, covering all major functional modules – SAP ECC, SAP S4/HANA with a global 24/7 coverage model. From humble beginnings to now receiving this award, it means a great deal for us to be recognized for our performance in the field of Basis and Technology Services, delivered by our SAP team in 2018. This means pride, prestige and a plethora of opportunities for all of us at DigitalOnUs to keep expanding our SAP Business Practice. This award will inspire our Functional team to make similar strides in delivery excellence and help bag the award next year. Suri Chawla, our CEO and Terry McNicholas, VP, SAP Delivery were presented with the award in person at the Cloud Application Services Strategic Partners meeting in Rome on March 11th2019. “This award means Recognition, Satisfaction, and Motivation that tells us that all the effort was worth it, that we can achieve more, and that we are ready for the next level”, they said upon receiving the award. While we don’t need to thank family, we, at DigitalOnUs, are so proud of our Basis teams in Mexico and India, managed by Emanuel Fernandez, Director, Global SAP Cloud Application Services. This award is a recognition of their relentless efforts, motivation, positive energy and taking pride in customer success. Three Cheers to the DigitalOnUs Family!! !